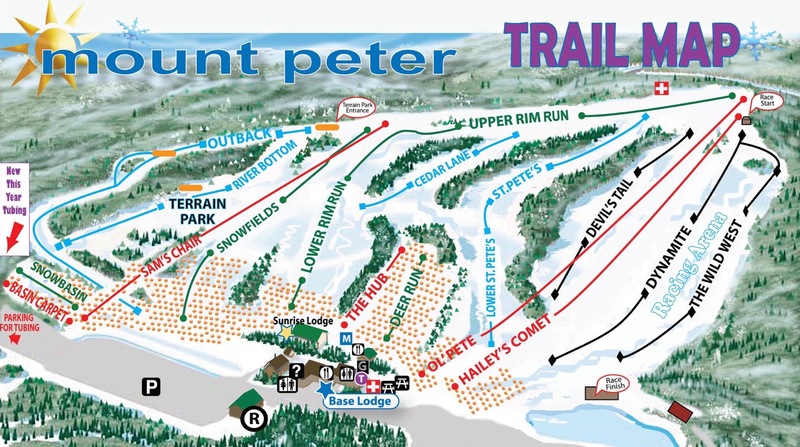 Mount Peter ski area is located about an hour north of New York City in Warwick, NY. Mount Peter is a very good place for learning how to ski/ride. The area offers free beginner lessons on all weekends and holidays and they have a great mid-week deal for learning to ski or ride. Mount Peter caters to families. They have a single base area and all of the slopes are easily visible from the lodge. This means that parents can let their kids ski or ride on their own or with their friends without worrying about them getting lost. Also, there are many events that are geared toward families and young children. For example, during their 2 large events, the Winter Carnival (late February), and the Spring Rally (mid March) they offer a magic show, obstacle course, cardboard box race, and many other games on and off the slopes. Mount Peter also has very good snowmaking and grooming for a place its size. The area offers 4 lifts, 3 double chairs and a handle tow. The primary lift is called Hailey’s Comet; it’s the newest and fastest chair, servicing all of the trails. Old Pete runs right next to Hailey’s Comet and it is used as a backup/overflow lift on weekends and holidays. Sam’s Chair is located on Rim Run and Snowfields and is popular for skiers and riders lapping the easier trails and/or the terrain park. It too is mostly used on weekends and holidays. The handle tow is called The Hub and it services the bunny slope located on Deer Run only. Night skiing is available on all days of the week except Sunday. Insider tips: Come during the week in the morning if you can, the slopes will be empty. Nights are a different story as many local kids come out after school to ski and ride. High school racing is also very big at Mount Peter. When there is a race or race training (almost every day) Dynamite and Wild West will be closed (this does not mean that the other trails will be free of racers). During race training the area can be crowded. Take care with young children and if you know that there is a race, be very vigilant. That being said, for a small mountain Mount Peter’s Race program has had a lot of success. Kei Kullberg, who grew up racing at Mount Peter, won the 2013 National Giant Slalom Championship. Also, the race director Rob Dowd was named by the U.S. Ski and Snowboard Association as the 2013 USSA Alpine Coach of the Year. The best time to go on the weekends is in the early morning (get there at 8am) and late afternoon (2pm-5pm). It can take a while for the crew to get all of the lifts running on some days, as Old Pete and Sam’s Chair only run when there is a line at Hailey’s Comet (as in a Six Flags or Disney style line). Once all of the lifts are running the lines are manageable. If you are getting rentals and have a lesson, then it’s recommended that you arrive an hour before the lesson. If you are not getting rentals, then half an hour is sufficient. Their slogan is “easy to get here, hard to leave.” The intended meaning is that it is very close to where you live and it is easy to get to, but you will have so much fun that you will not want to leave. However, if you come here on a powder day without a 4WD vehicle there seems to be a second meaning to this slogan as the exit driveway can be tough to negotiate.